Local Truck. One Owner. Accident Free. CLEAN CARPROOF. Bluetooth, NAV, Remote Start, Backup Cam, Custom Black Wheels, TOYO A/T Tires, LCD Touchscreen, Heated/Vented Power Leather Seats, Rear Heated Seats, Heated Steering Wheel, Moonroof, AUX/USB/SD, SiriusXM, 150W Outlet, Power Windows/Locks/Mirrors.Luxury meets epic power in this fierce 2015 RAM 1500 Laramie Crew Cab 4x4 presented in striking Bright White Clear Coat. It is powered by a 3.0 Liter Turbo EcoDiesel V6 that cranks out 240hp while paired with a TorqueFlite 8 Speed automatic transmission. 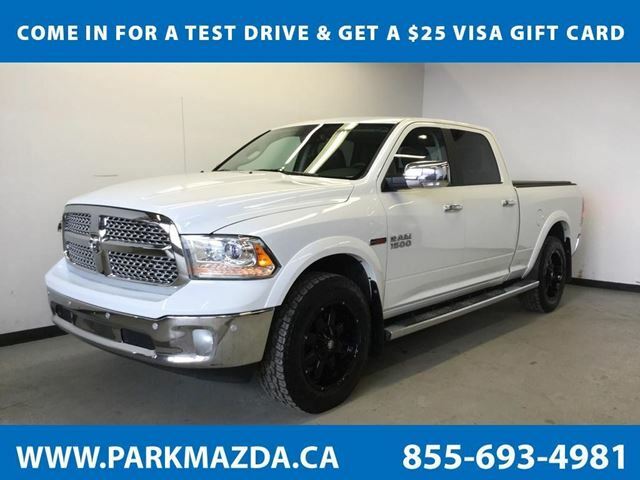 This efficient team rewards you with near 9.0L/100km on the open road, a smooth ride, and tremendous towing capacity!You'll make a powerful first impression in your 1500 Laramie that is highlighted by a chrome grille, a tuned dual exhaust, prominent alloy wheels and distinctive inserts that enhance the aerodynamics of this formidable machine. Inside the luxe wood grain and chrome trimmed interior, you'll find a prominent central touchscreen display with a rearview camera, UConnect with voice control, and a power outlet to keep you charged. Enjoy traveling in comfort and style with heated power adjustable leather seats, memorized driver settings, and a great sound system with a subwoofer. Anyone who sees it will admire the upscale interior that has been thoughtfully designed to meet your needs.Safety is priority number one and with stability control, hill start assist, trailer sway control, front seat side airbags and full-length side curtain airbags you can rest easy knowing you'll be safeguarded. Now is the time to make this 1500 Laramie your partner for work and play. Print this page, Come in for a Test Drive and Get a $25 Visa Gift Card... We Know You Will Enjoy Your Test Drive Towards Ownership! 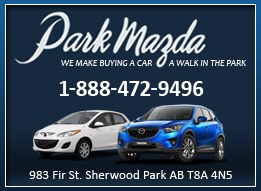 Welcome to Park Mazda's online showroom. 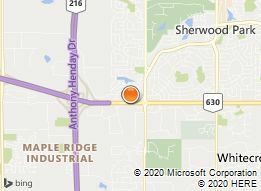 Our dealership is located in Sherwood Park. Looking to buy a car or truck? View our inventory of used cars for sale and contact us to schedule a test drive.